A face too cute to eat! Seeing gingerbread faces wherever you travel is a sign that the holiday Christmas season is in full swing. Not every gingerbread person will have a face just like the one described above. The fun in creating gingerbread men is to give each face its own special personality and character. Create a special face just for grandparents. Add glasses, whiskers or a pipe for grandpa; an old fashioned bonnet is perfect for grandma. A baby face is easily made out of gingerbread. Make the cheeks as chubby and round as possible. At the top of the face, add a single curled tuft of hair in white icing. A bow in the middle of the curl could identify a baby girl. While most gingerbread faces are that of men, females can be made with ease. Long eyelashes and brighter cheeks are typical characteristics of a woman's gingerbread face. Adding a large bow at the top of the head is another way. Making the mouth red or pink can help, too. Surprise: Use a "take a bit out" cookie cutter that has a fake bite taken out of the gingerbread man's head. Draw high eyebrows and a small "o" for a mouth to indicate surprise. Grumpy: A wrinkled nose and frown make any happy face upset. To add a little charm, give the grumpy man some downward pointing dimples. Winking: A smiling face with a winking eye is a whimsical alternative to a simple happy gingerbread man's face. Kissing: Give your sweetheart a face with lips puckered and eyes shut (straight lines in icing). 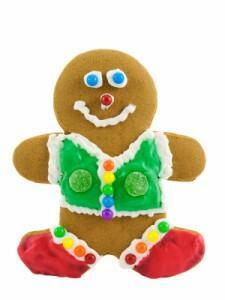 You can even make your gingerbread man dress up in other holiday characters. Give him a Santa hat or a big red nose, ala Rudolph. Though snowmen, Santas and religious figures continue to be popular decorating schemes, the gingerbread face is a great option for those who want to break out something new. Not only is it the perfect Christmas décor for the kitchen, but gingerbread faces can be used throughout your home during the holidays. Giving a gingerbread gift is perfect for a grab-bag Christmas gift exchange. Men and women alike will appreciate the whimsical decorative touch your gift will add to their home. For those who enjoy Christmas craft projects, it can be hard to focus on getting your homemade Christmas gifts finished when little children are interrupting. Keep kids busy with this simple Christmas craft for kids that makes gingerbread face masks out of felt. Trace around the plate onto the brown felt. Trace two eye holes using the small glass and cut them out. Draw a large smiley face using the black permanent marker. Add dimples if you wish. Trace two circles in the pink felt using the small glass and cut them out. Glue the pink circles above the dimples to indicate cheeks. Hold the mask up to the child's face. Staple the string to the mask so the string rests above their ears. Read the story of The Gingerbread Man, allowing children to take turns acting out his part. Depending on the age of the children involved, you may need to precut some of the felt pieces and provide help with stapling the string. Providing an example of a finished mask is a good way to keep older kids on the right track without constant supervision.